Offering you a complete choice of products which include automatic macroni making machine and macaroni making machine. It is a kneading/ mixing press for fresh pasta of extrem compactness and solidity. 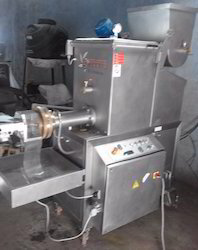 Essential, functionally and efficient as a working instrument for industrial production of any shape of short and long fresh pasta cut automatically in the dimensions by roatating knief. Body of machine is made up of stainless steel. It is a kneading/ mixing press for fresh pasta of extreme compactness and solidity. Essential, functionally and efficient as a working instrument for industrial production of any shape of short and long fresh pasta cut automatically in the dimensions by roatating knief. Body of machine is made up of stainless steel. Looking for Macroni Making Machine ?